Garmin has unveiled the Approach X10, which joins the ranks of its golf GPS watches and bands. However, unlike the company's current line-up of golf watches, the new Approach X10 aims to keep things basic. 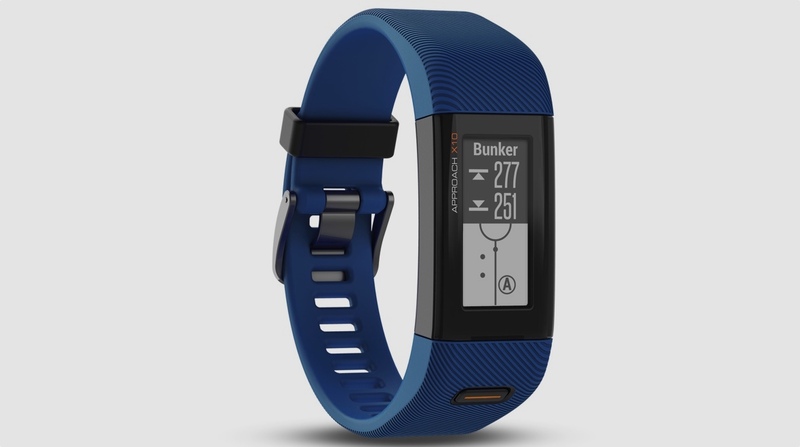 Built-in features include distance and hazard data for 41,000 golf courses worldwide, but the X10 eschews the more complex features found on the likes of the Approach X40, Approach S20 and, most prominently, the all-dancing Garmin Approach S60. The design is more like a traditional fitness band, presumably building on the success of the X40. It's thin and unisex, and while it's not the best looking band out there, it's not particularly offensive. There's a 1-inch monochrome screen and it's controlled using the touchscreen display and a simple home button found underneath. Gone are features such as swing analysis, swing tempo and integrations with Garmin TruSwing. Gone are the shot tracking and recording of clubs used and scoring on the wrist. And the activity tracking features, heart rate and smartwatch notifications are also surplus to requirements. But all the key features are still present. You get distance to the pin, hazards including key lay-ups and dog-legs. What's more, the green view is still found on the Approach X10, so you can zoom in on every green, check the layout and position the flag exactly, to get a properly accurate figure. The Approach X10 also comes with a revamped Garmin Golf app, which offers scoring, handicap tracking and live leaderboards between friends on the same course. You can set up mini tournaments, and invite friends to participate. Obviously, when devices cut down on features, you expect prices to do the same. The Garmin Approach X10 has an RRP of $199 – which comes in well under the price of the Approach X40, making it one of Garmin's cheapest golf devices. We hope to get our hands on the X10 to see if its worth taking on your next round.